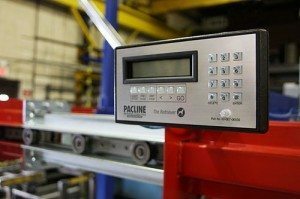 Home » Pacline Articles » Overhead conveyor simplifies the storage and retrieval of hanging items. Overhead conveyor simplifies the storage and retrieval of hanging items. 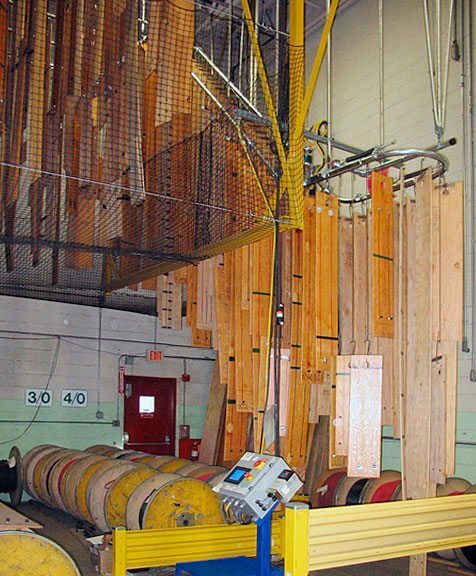 Just as the name implies, the RETRIEVER is an ASRS device (Automated Storage Retrieval System) using an HMI (Human Machine Interface) to bring a specified item back to a load/unload area that has been stored on an overhead conveyor storage system. This retrieval system is ideal for recalling a stored item which has been placed on a storage conveyor. It’s location pendant has been logged and the device is then used to recall that pendant with the push of a button. A typ­i­cal sce­nario for this sys­tem would be the storage of numer­ous items and having the convenience of recalling these items on demand. This would include applications such as gar­ments in a dry clean­ing facil­ity, cut­ting dies from a fab­ri­ca­tion plant, wiring har­ness jigs or any num­ber of items that need to be stored. The RETRIEVER™ is small, very easy to use and an affordable solution for this specialized ASRS need. The RETRIEVER™ also acts as an interface between a computer database and the conveyor. In fact, it will control several storage conveyors from one device. If you have a large inventory database and several conveyors all loaded with this catalogued inventory, let the RETRIEVER™ handle the job of returning a specific load pendent which holds a particular item. Your database computer can connect directly to the RETRIEVER™ ASRS and feed this system with the pendant numbers. The RETRIEVER™ also handles a load retrieval queue. By either manually entering several pendant numbers or instructed through a database connection, the device will methodically move from one pendant to the next as items are either loaded or unloaded and then triggered to move onto the next item on the list. Overhead storage is another advantage to this system. 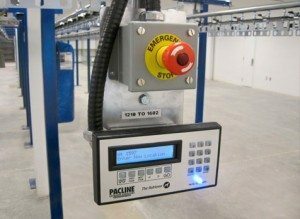 The PAC-LINE™ overhead conveyor is famous for turning unused overhead space into valuable real estate by moving many items up and off the floor area. In combination with the RETRIEVER™, this once dead area is turned into valuable storage space for any number of items hanging off a conveyor system.